In 1997, I created over 200 Adobe Illustrator drawings for the release of Oracle8. By 1999, when every programmer on the planet was working on the Y2K problem, I was doing HTML for a small marketing group at Oracle. 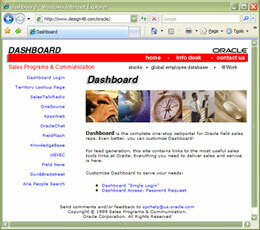 The project was to build an intranet portal for the sales force called Dashboard. The group had previously been responsible for the inhouse publications and radio podcasts (as we would call them now.) The challenge was to format all of these products for distribution and use over the intranet.